I didn't partake in the festivities last week, mainly because I didn't have anything really to share. I had been trying to eat more clean and ditch the junk all week. But as soon as I was halfway through my sandwich or pasta I would suddenly remember that I had forgotten to take a picture. And who wants to see half-hearted photos, with half-eaten sandwiches? So I decided to just take the week out and participate again next week, and I am happy to report that I managed to get quite a few for this blogger link-up. And that I am actually quite proud of myself. 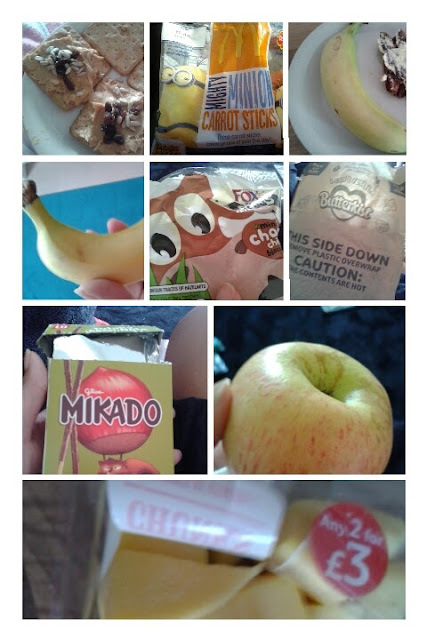 I think it is always useful to take a sort of photo diary if you will, of everything you've eaten throughout the day. Even if you can do it for a few days, I always find it interesting to see what I am eating on a day to day basis. Anyways, I managed to keep my phone close (so excuse the quality of the photos, I know it's not the best) and snap photos of the food I was eating throughout the days of Mon-Thurs. The weekend came and I was way too distracted to find my phone and snap my food. So with that said here's what I have been eating mainly on weekdays. Snacks. Popcorn. Mango. Mikado (Awesome Breadsticks Covered in Hazelnut Choc). Banana. Gala Apple. Cookies. Carrot Sticks. Krackawheat with PB and Sultanas. Malt Loaf with Margerine. Spicy Pasta with Cheese + Peppers and Red Onion. Fajita Chicken Wraps with Salsa and Mayo. (Top Right is actually a Roast Pork Dinner!). 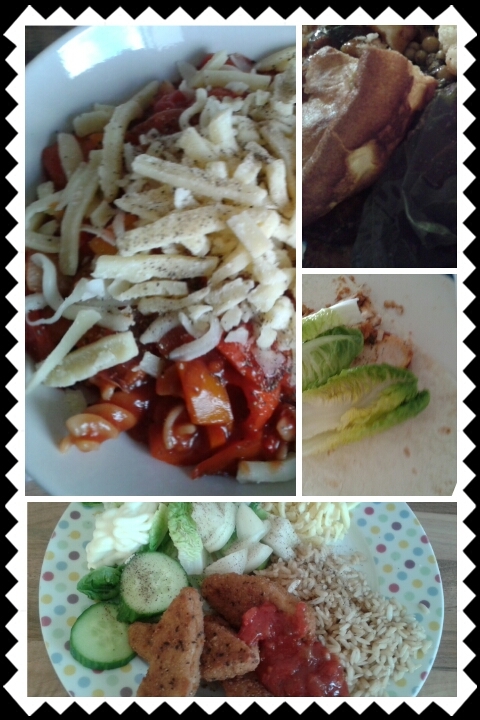 Southern Fried Chicken Strips with Brown Rice, Salad, Salsa and Mayo. 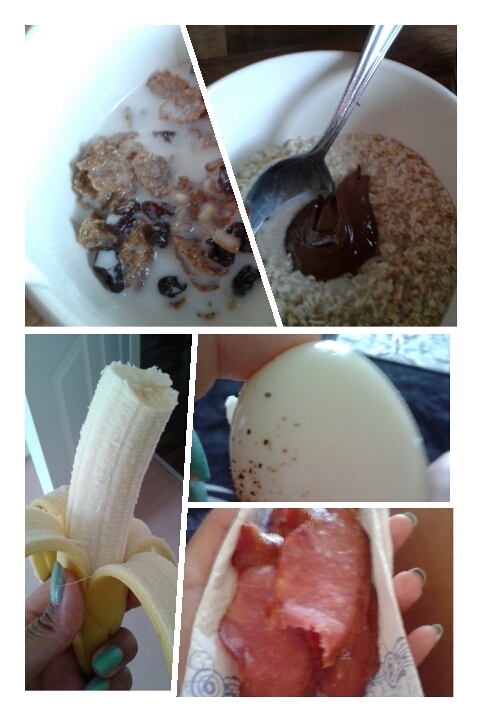 Breakfasts. Bacon has been a feature in my life, my mom and sister are huge fans! Boiled Eggs. Bananas (Always, I swear I eat two a day now. Whoopsy!) + Cereal: Bran Flakes with Raisins, Sunflower Seeds and Milk. Porridge with Almond Milk and Nutella. Have you been a serial snacker lately, like me? I am but I have been working on it. Anybody else trying to eat a bit better lately? I had fallen back into bad habits again. It's ok to have a packet of crisps once in a while, but not everyday! How does everybody else feel about Cereal Toppers? Lately I cannot get enough of cereal toppings. I have been adding Raisins, Honey, Nutella, and Sunflower Seeds to my cereal whenever I get the chance.